"Science resources great for organising and sorting groups." "Egyptian symbols were used in a Y5 history lesson. A group of 4 children were pre-taught the vocabulary using symbols. The class teacher was amazed at the children's increased confidence in the class discussion. (He has been converted)." "Found the word books for forces very useful. Will make own for topics not already covered." "Makes it much easier to differentiate activities - especially for literacy and science." "The range of resources is very daunting. Can they be structured more easily into topic folders?" "Zed reading books very useful in reception." 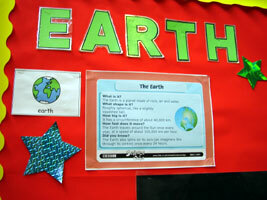 Y1 teacher "I was really surprised at the high quality of the resources." "Visual timetables help prepare children for routines and promotes independence." "Helps lower ability pupils work independently." "The student teacher found it easy to deliver the Gunpowder Plot to mixed-age class." "Student teacher found it easier to use symbols to teach phonics than getting pictures off the Internet." "Visual support (in the Zed Books) was great for statemented child." "Y1 - Individual symbolised behaviour target boards really focus children on their own behaviour." "Symbols materials really helped children be independent." "Enabled less fluent readers to access the vocabulary." "Y5 teacher - Keys visual learners in - 2/3 of class prefer symbolised resources." "Favourable comments received from other staff: Children enjoy having symbols and are focused by them. " "An Elective mute child is making up own signs based on symbols to use with key worker when working on the first 90 words." "Able to read high frequency words in isolation with symbols, but not in context (without symbols)"
"Reading books well used (Zed Books)"
"Making an obvious difference to all lower ability children that I have tried it with. " Class teacher: "All the symbol support work about the Egyptians really paid off as Alex was able to join in with the class activities and answer questions and contributed generally to the session. Teacher felt that would not be possible without the IDS contact's support. Alex was very proud of the CIP booklet and games he managed." Class teacher- "All the symbol support for the pre-learning key concepts on the solar system has helped Yan to access the curriculum. This has increased his self esteem and confidence. He was able to use the resources/games with other members of his class. He was able to answer questions that others could not." "Reception staff have used the symbolised Diwali story and the colouring pictures. The class teacher reported that after reading the story there children were confident enough to act out the story with symbol and adult support." 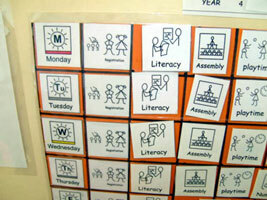 "Literacy Activity Yr1 - the class teacher used symbols to support a lesson on following and giving instructions. Each pair was given a symbol chart and most were able to give simple instructions eg 'Go forward 2 steps'." "Joint teaching with Y3 teacher on creative writing. We used symbols to support the 5 different story elements. Most children were able to use the symbols to plan their own stories over two hour sessions independently." "The reception teacher used the CIP symbols when retelling the story 'Owl Babies'. The teacher reported that the symbols had helped the children to remember the key events." 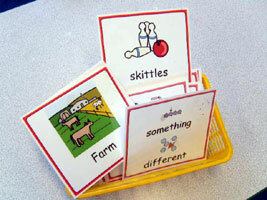 "Individual pupils able to use CIP to make their own booklets eg about sequencing the day. They can put in their own pohotos - a real sense of achievement and engagement." "TAs have been very enthusiastic after training and have taken ideas back to the classrooms." "Staff are now asking for symbol support training"
"The head teacher asked for a 'knock and wait' symbol which has been put at a suitable height for KS1 children to see."